Both hydroponic and container growers need a few extra pieces of kit compared to traditional ol’ “in the ground” gardeners. If you have a proper hydroponic set up, then you need a lot of extra kit. pH meters are useful tools for both gardeners of all stripes. In a hydro setting, they’re important for ensuring that your nutrient solution is up to scratch. For container growers, they’re good for checking that your potting mix is in the right pH range. In this guide, I’m going to take a deep-dive into the topic of pH meters. It’s an interesting subject and, as a gardener, it’s worth acquainting yourself with some of the key concepts and terminology. If you’re only interested in the short version, see directly below. Otherwise, let’s jump in. Click here to jump to our selection of some of the best pH meters from around the web. Manual pH kit – These work by using different chemical solutions to change the colour of a soil slurry or solutions. They’re probably the oldest type of pH testing kit there is and they’re widely available. 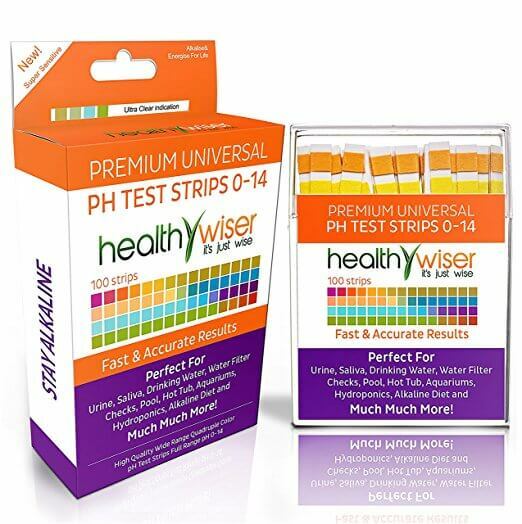 pH test strips – Remember the pH strips from science class? Well these are exactly the same thing. They will change colour depending on the acidity/alkalinity of the solution in which they’re dipped. They can be used with soil. pH strips are an inexpensive way of testing soil. 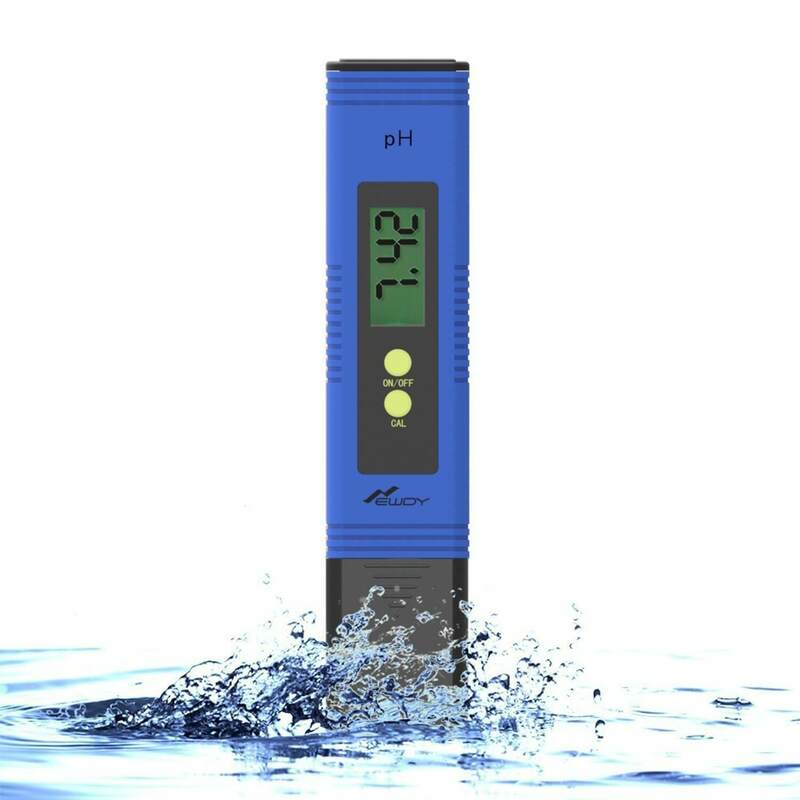 Digital ph meter – These work electronically. The exact science is explained below. More often than not, glass sensors are able to measure the presence of certain ions in the solution (or directly in the soil). 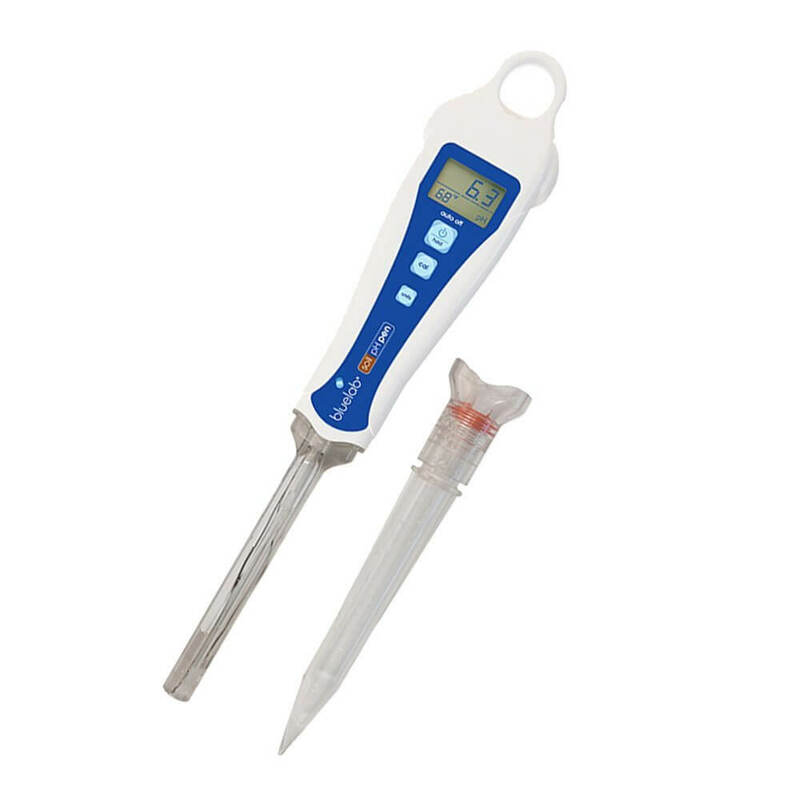 “Combo” pH meter – These tend to use the same technology as a digital pH meter but also include a moisture and light scale. Light meters are perhaps one of the most unnecessary garden innovations, but that’s just my opinion. Do you need a pH meter? Regardless of what the big online retailers would like you to think, there aren’t that many essential gardening tools. Pots, a trowel, some secateurs – you can get by with relatively little. Personally, I’d also include a pH meter in the bag of essentials. The real question is whether you need an expensive model, such as those made by Bluelab, or an inexpensive one. If you’re growing hydroponically, then the advanced equipment will be a better option. They require more maintenance, but the readings are much more accurate. For container growers, you’re only really looking to get your mix into a stable range, rather than get the mix to an ultra-specific level, so whilst the higher-end meters are ideal, you can get away with equipment further down the scale. For typical soil testing, the same principle applies. The more advanced equipment is the best, but you can usually get away with mid-range units. Can I use a soil meter for a nutrient solution or vice versa? 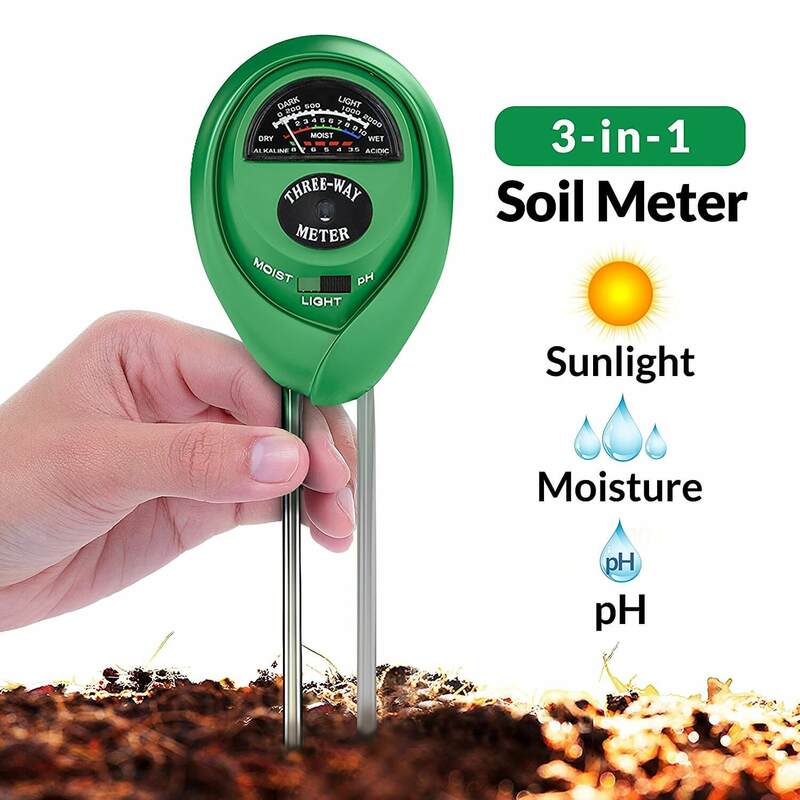 A common question involves whether or not you need a specific type of meter depending on whether you’re measuring the pH of soil directly or a nutrient solution. The short answer is yes. Both soil and hydroponic-oriented meters work in a similar way, but my own experience, along with that of others, is that they’re not transferable. My brain isn’t big enough to understand the exact science but…well, I’ve put together a little outline below. If you’re as unscientifically (I hope that’ a word) minded as I am then it will explain how these little gadgets work. Soil pH is measured scientifically by first making a slurry (you won’t usually need to do this) so technically, you would actually be measuring the pH of a liquid. Soil strips work on this basis. 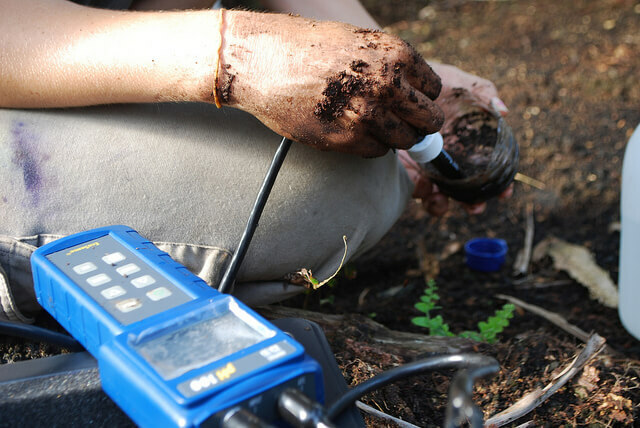 If a meter doesn’t have the word “soil” in its name, then you’re probably OK to use it for measuring solution. Alternatively, if you’re measuring the pH of your potting mix directly (which can be important if you’ve done it yourself) make sure it specifically says that it’s for soil. At it’s foundation, pH is a measure of the hydrogen ions in a solution. Hydrogen ions, which have a positive charge, together have a capacity for electrical current (voltage), and this is what a pH meter measures. A meter is essentially a voltmeter that measures the voltage of a conductor, in this case the solution. Remember, voltage is a measure of potential electrical force. There are usually two main parts of a pH meter: a probe and a reading/display screen. The probe tends to be made of thin glass, which encases a silver wire submerged in a neutral solution. Because the solution inside the glass is neutral, this can cause a buildup of hydrogen ions on the outside of the glass, and thus an electrical charge. This is measured by the voltmeter in the meter, the reading is used in a pH equation, and the display shows a pH value. Simple! How does this relate to soil? The (very) short answer: The pH of the water in soil (also known as the soil solution) affects which chemical processes can occur, which in turn affects which nutrients are available for a plant’s roots to take up and use. Most plants thrive in a soil that is slightly acid to neutral (6.0 – 7.0) but there is a degree of variance depending on species, family etc. The pH of the soil solution is determined by the minerals, compounds, chemicals etc. present in the soil. That’s why you can alter soil pH by the inclusion of additives like lime in your mix. To quote: “Soil acidity is controlled by the amount of hydrogen (H+) and the aluminum (Al+++) that is either contained in, or generated by the soil and soil components. ” The soil releases these various sources of acidity or alkalinity, thus changing the environment in which nutrients are available for plant uptake. As a container grower you don’t need to worry too much about achieving an exact pH. The pH of potting soils is very variable, much more than “ground soil”. Depending on the initial pH of your potting media ingredients (if you’re using acidic peat for example), you may need certain additives, particularly lime, but it’s difficult to get it exact. A lot of variables, from temperature to weather, can affect the pH of your mix. 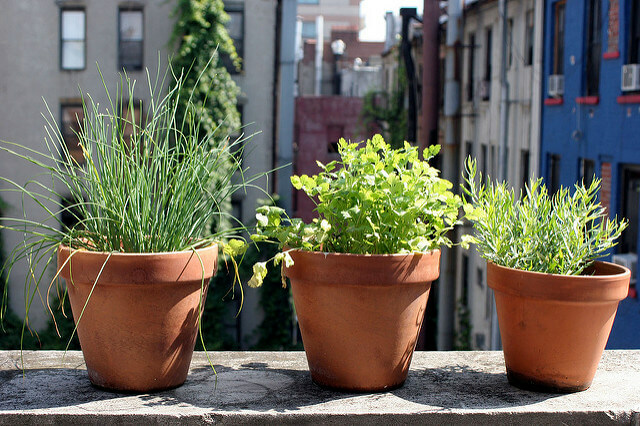 Container gardeners should regularly check the pH of their potting media. Potting media tend to have quite a low buffer capacity. This means that the mixture is much more prone to pH changes than soil. What you want to look for is an OK range, with some experts suggesting a monthly check. If you’re liquid feeding, the good news is that the pH of your solution won’t be significantly affected by the contents of your media. Changeable batteries – It’s a telltale sign of a cheap model if the batteries aren’t changeable. You’ll also want to make sure batteries are included. Clear reading screen – Look for a screen where the information is clearly displayed. Protective cap – The glass sensors can break easily, so it’s important that they have a protective cap. Proper instructions – A lot of the more advanced pH meters require prep and maintenance with specific tailor-made solutions, so make sure all the right documentation is included. Moisture/light meter (if you want them) – Personally, I’m not too bothered about these. If you do want them, however, make sure to check that they’re included. 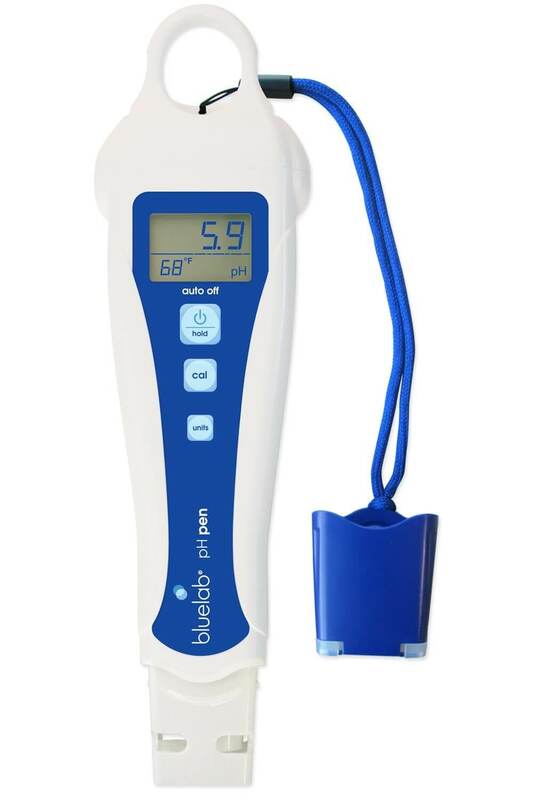 If you’re after an accurate, high-quality pH meter for measuring nutrient solutions or other liquids, then you can’t go wrong with this “plant pen” from Bluelab. It’s a high-quality piece of equipment and it’s worth investing in something like this because it will last a long time. It has all of the features you would expect – backlit screen, waterproofing, replaceable AAA battery and a cap for the sensor. The pH pen needs to be hydrated before the first use. pH pens do have a tendency to break if they’re not regularly hydrated so it’s worth making sure you repeat this process at least every 30 days (with normal water as opposed to distilled, which can alter the chemistry of the sensor) and a weekly addition of storage solution to the cap. It also has a celsius/fahrenheit temperature reader. The calibration needs to be done in Bluelab calibration solutions (for acid and neutral) which are easily available. Where the Bluelab pH pen is for use with liquids, this “soil pen” can be directly inserted into soil or potting media, making it ideal for container growers. It’s very accurate and a good choice for growers that want to properly measure the pH of their soils, rather than find a suitable range. It includes a standard pH reading along with a temperature reading. It’s a high-quality piece of kit and the list of features speak of the care that’s gone into making it. The LCD screen is backlit and there is both a low-battery indicator and an icon for successful calibration, which is always useful. As with the model listed above, it comes with a storage cap that’s used to keep the probe wet. Before first use, you will need to hydrate the probe and calibration will involve using the Bluelab solutions mentioned above. They’re relatively inexpensive and easy to get hold of and you should only need to buy them once. If you’re serious about hydroponic/container growing and don’t want the hassle of having to make a soil slurry, then this professional piece of kit is ideal for you. Personally, I’m a big fan. This is the pH meter I use and it’s worked without a hitch ever since I bought it. As has already been mentioned, the proper way to test soil is to make a slurry, and the explanation of how pH meters work should illustrate why this needs to be the case. It comes with a sunlight, moisture and pH reader. The moisture reader can actually be quite useful as the “thumb method” (insert into the top of the pot/soil up to your first knuckle to check if the soil is dry/wet) is far from foolproof. The sunlight meter is, in my opinion, completely surplus to requirement. But that’s just me. There is some debate about the effectiveness of these inexpensive models. If you consider all the maintenance and prep involved in getting the Bluelab pH pen ready for use then you can understand why many are dubious of sensors that are never prepped in any way. My advice to gardeners, container growers in particular, is to use this pH meter as a rough guide. If you don’t need any more than that – you’re happy with knowing slightly acidic/slightly alkaline – then you’re good to go. If you make your own potting mixes with peat moss, then you can test whether or not your additions like lime have brought the pH into an acceptable range. The models listed above sit pretty much on opposite ends of the price spectrum. If you want to give something a little more mid-range a try then the Newdy Digital PH Meter might be the right choice. I haven’t personally tried it but it’s very popular on Amazon (I think I’m right in saying that it’s the most popular unit). It requires calibration like the Bluelab meters and the process is relatively simple. A buffer powder solution is provided, along with a screwdriver to set the required reading. The cap protects the glass probe . There are a range of positive reviews on Amazon – from people using it for everything from fishtanks to hydroponic solutions – so I’d recommend it if you’re not ready to invest in a higher-quality model. It doesn’t come with a warranty, which is the only downside. You have got a choice between yellow and blue though! What are your thoughts? Have you tried any of the pH meters above? Do you have your own suggestions? Leave a comment below and let me know! If you want a good introduction to the important chemistry concepts underlying container media then this series of short articles by Prof. Robert R. Tripepi is well worth reading. There are five in total: Part 1, Part 2, Part 3, Part 4 and Part 5 (each is about 4 pages long).